When your Subaru is in need of new parts, you could always get cheap aftermarket parts--but getting genuine Subaru parts is always a much better choice. Unlike non-genuine parts, genuine Subaru parts are held to the high standards set by Subaru, so you know you're getting nothing less than the best quality. Not only will you feel more at ease with the quality of genuine Subaru parts, but they'll often save you money in the long run: though aftermarket parts can be less expensive up front, they also tend to wear out sooner (or fail entirely), making it necessary for you to get a replacement part sooner than you should or even have to pay for costly repairs later. When you're looking for a great selection of genuine Subaru parts, look no further than Tom Wood Subaru, your Subaru parts store serving Westfield! Your Subaru is a high-quality vehicle that deserves nothing but the best--and you can find the best at the parts store here at Tom Wood Subaru, serving Carmel and Zionsville. Our parts store is filled with all the genuine Subaru parts, chemicals, and accessories you need for your next DIY project, whether it's something big or small. Of course, there are some jobs that you'd rather leave to the professionals, which is why we also have a state-of-the-art service center. And of course, when you're looking for a new Subaru, you can come by our lot, which is filled with a great variety of new Subaru vehicles (not to mention our selection of high-quality used vehicles and Subaru Certified Pre-Owned vehicles). 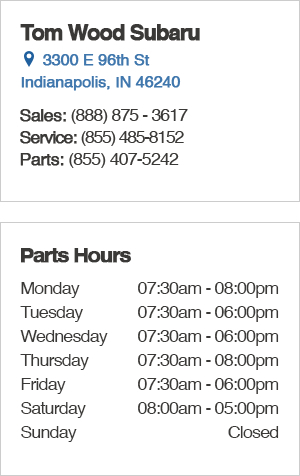 Ordering parts is easy--you can call us at (855) 485-8152 or just stop by our parts store at 3300 E 96th St, Indianapolis, IN 46240--it's well worth a drive from Fishers or Noblesville! We hope to see you soon at Tom Wood Subaru.